Hello, I am the pineapple girl! I even have the cocktail umbrellas for a tasty pineapple cocktail with me. 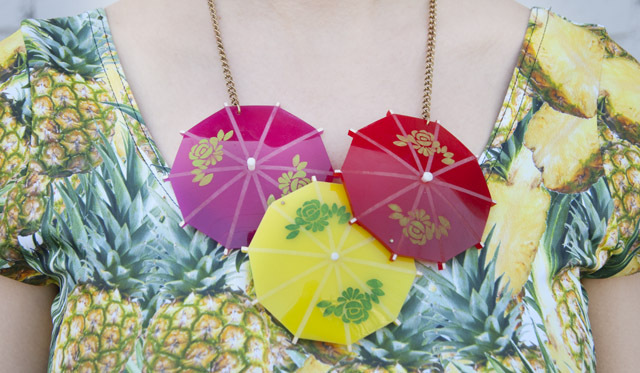 Oldie but goodie: Still one of my favourites from Tatty Devine. Do you want me to mix you a cocktail too? 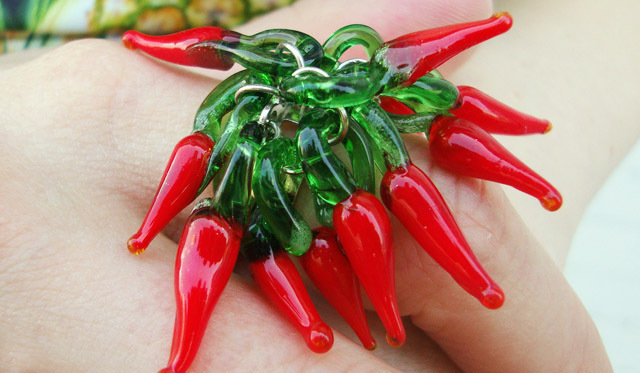 For the right amount of spice: A chili ring. I am humming Carmen Miranda songs. 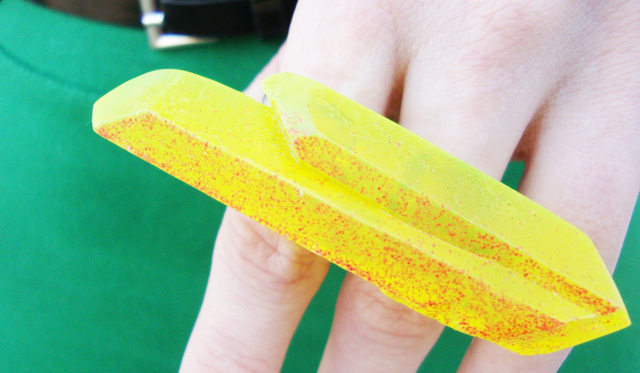 Love this mysterious yellow double finger ring. 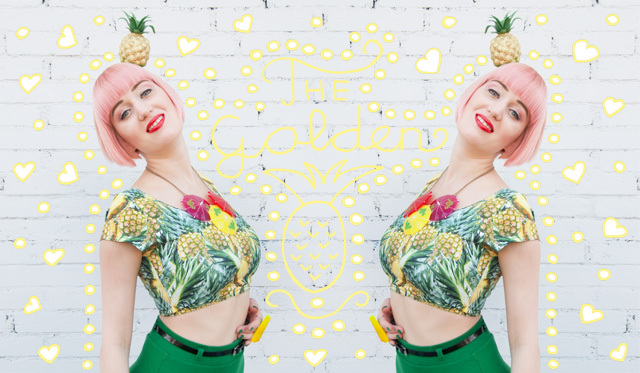 Do you think golden pineapples are holy? I don't know, but they are gorgeous for sure! Did I promise you more pineapple looks? Here is another one and it's even more fruity than the last one. Probably this will be the last crop top I show you this season, before it gets too cold. 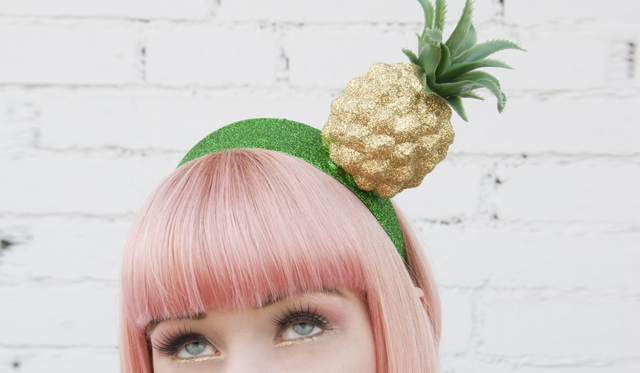 I am madly in love with the pineapple fascinator. Sometimes I wear it at home to just sit on the sofa or do the washing up, because wearing it makes me so happy. 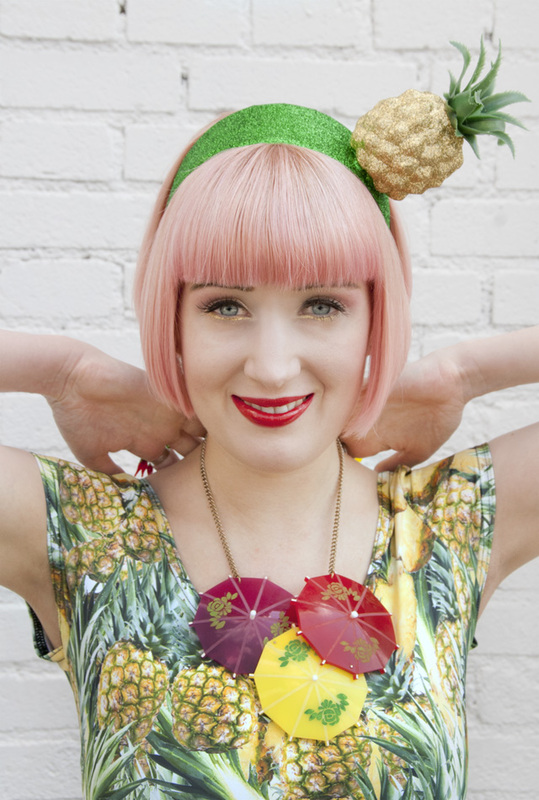 It's very Carmen Miranda and I think the colour combination of the golden pineapple and the green headband is perfect. Definitely another favourite from my favourite hatter Pearls & Swine! During this summer, I gained a lot of self confidence. When spring arrived, I didn't know if I would ever wear a crop top again, because I was not sure if this trend is still fine for girls no longer in their teens. This is the shortest crop top I bought and I am really happy to wear it. I think we all should be more daring, have fun and don't care too much about the perfect body magazines show us. Models are old with 25 nowadays, isn't that ridiculous? Eat pineapples, eat chocolate cake and wear crop tops or whatever you like to my lovelies and never let somebody teach you something else! Whatever you wear, wear it with confidence and it will look stunning. How do you like this pineapple dedicated outfit my lovelies? Thanks a lot to Pearls & Swine for this fascinator. Having a pineapple fascinator was one of my childhood dreams. I love and want it all. So wonderful! Dear Sara, you are a very special style icon I love it! I'm glad you won confidence with yourself, that's great, I stopped worrying me so people say has long ago. Pineapple Kisses my dear girl! You look fantastic, surely have nothing to worry about! Wow!!! The pineapple headband and the chilli ring!!! Love! The whole outfit is just amazing! I love your skirt and... everything! where did you get this pineapple hair band/? It looks so cute!! !